Starts at $39.99 for 250 cards, $49.99 for 500 cards, or $64.99 for 1000. 100% Satisfaction Guarantee! Over 3700+ store reviews! Scentsy business opportunities have shown many home based business entrepreneurs a sure shot way of making lucrative money, even in a slumping economy. In fact, an increased number of people now prefer to eat in rather than go out for expensive dining and this makes Scentsy an even more profitable business. The products from the line are hugely popular with clients and naturally when you become a Scentsy sales consultant, you get to mint money like never before. Your business card is your identity and so it must hold the best designs. 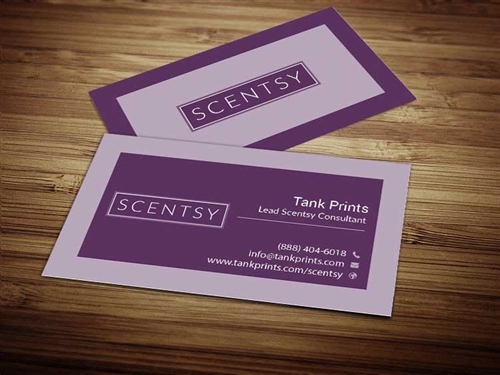 Personalized Scentsy Business Cards are protected with UV or matte coats and can also be embellished with some of the more premium coating options, if you prefer that, at negligible costs. Your business card is admittedly your finest promotional tool and hence you must ensure that it is THE best that you choose. Custom made professionally printed business cards at the most competitive rates must be your first choice and nothing else. 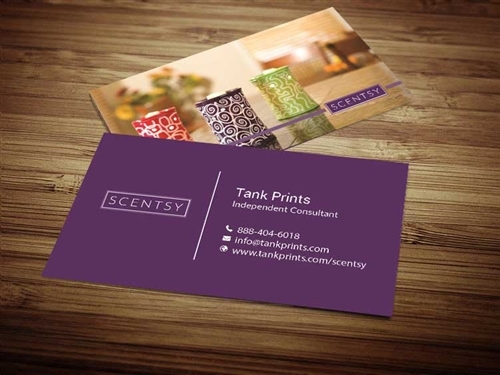 Scentsy Business Cards are stamped on a 16 point card-stock on premium grade paper and are therefore many times more durable than the average varieties. Choose from a range of designs listed below but if you have something special in your mind, we will be more than happy to design it for you at zero cost. All business cards are tailor made as per client requirements and specifications. Order now! Choose your design, type in your information, “Add to Cart”, make your payment and order. We accept all major payment modes (0% sales tax) and process and ship your order FAST! Once you order, your personalized cards will be delivered to you within 5 working days.